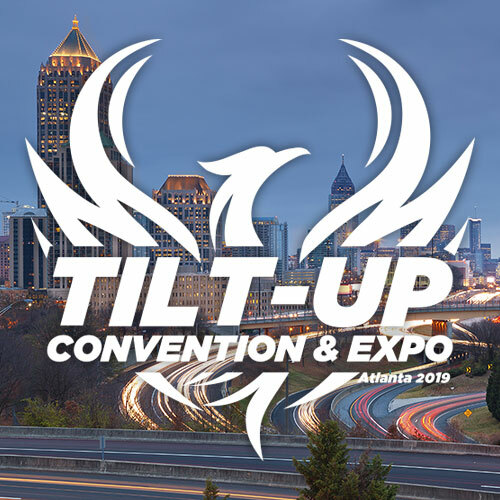 What do dessert and tilt-up construction have in common? Both begin with a vision, skillfully executed by a pastry chef or design architect with meticulous planning, ingredient selection, coordination, presentation, and then……“BAM!” The latest creation is now ready for enjoyment. 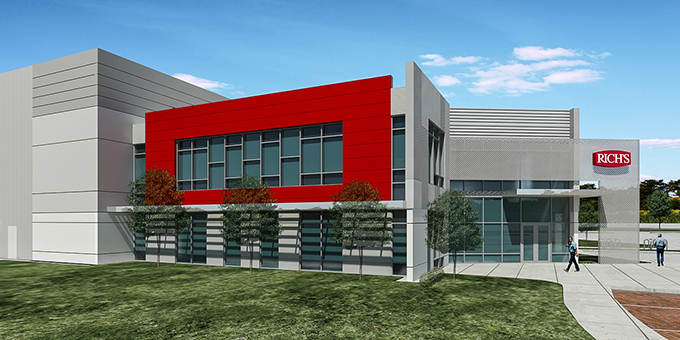 Rich Product Corporation, a frozen food manufacturing and distribution company, recently broke ground on a new cheesecake baking facility in Missouri City, Texas. True to its pioneering spirit, Rich’s goal was to streamline their workflow for more efficient production of their delicious desserts. Rich’s, established in 1945, was the founder of the non-dairy segment of the frozen-food industry and to this day is the industry leader in product innovations with facilities around the globe. As a leading supplier to the global food service, in-store bakery and retail market places, Rich’s posts annual sales exceeding $3.2 billion, operates 36 manufacturing facilities spanning six continents and employs more than 9,200 people across the world. 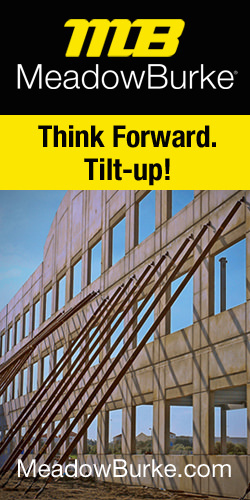 Considering the new facility’s accelerated timeline and food safety guidelines, concrete tilt-up was the clear choice. To develop a design program, Rich’s partnered with long time tilt-up veteran, Seeberger Architecture. 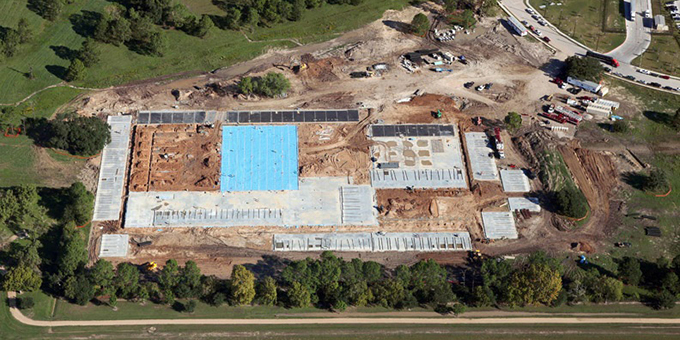 While tilt-up design and construction is commonplace in the southeast Texas region, this new facility is far from business as usual. 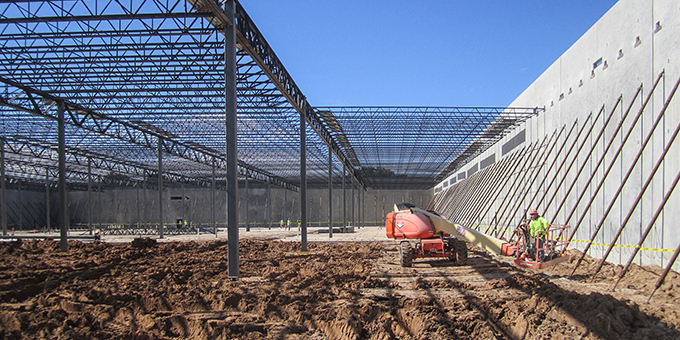 The two-story office/warehouse tilt-up facility is under construction on a 20-acre tract of land in the Lakeview Business Park, the site of a former golf course in Missouri City, Texas. The new facility’s location proved to be unique due to its triangular shape, limited street frontage and abundant supply of used golf balls discovered during site grading and excavation. Due to the linear sequence of its manufacturing process, the production facility is efficiently contained within a rectangular building volume, which is divided into eight main work areas: baking, mixing, ingredients, packaging, dry storage, washing, blast freezer and a freezer warehouse. Each work area varies in temperature ranging from over 110 degrees Fahrenheit to minus 10 degrees Fahrenheit. Varying thicknesses of white, metal clad insulated wall panels were installed throughout the facility to ensure climate control within each of the work areas. Extensive requirements and regulations were adhered to when designing the manufacturing process. USDA guidelines for food safety contributed to a major portion of the building floor slab being sloped to numerous drains throughout the facility. Freezer areas required a glycol radiant heat tubing system below the floor slab to protect the foundation and subgrade from freezing. Office and training areas are enclosed in a separate, two-story building volume, allowing individual design expression, while maintaining a cohesive overall facility design. The office building is a compositional convergence of concrete, glass and metal features, appearing to be recessed within parallel concrete planes. Red aluminum elements were used to disrupt the panel rhythm and reinforce the Rich’s branding. A dynamic pattern of vertical reveals evoke movement within the office exterior walls. This same rhythm is continued within the curtain wall system and storefront windows. With limited street view frontage, a corrugated perforated metal panel screen was utilized to augment the office façade and shade the two-story glass entry lobby. “Many factors influenced the exterior design, including the Missouri City Planning and Zoning requirements, the Lakeview Business Park guidelines and Rich’s corporate identity,” states project designer Jorge Romero, of Seeberger Architecture. Due to the large areas of under-floor slab freeze protection and the multitude of sloped floor drains, the traditional construction method of casting wall panels on the slab was not an option. The contractor, Cadence McShane Corporation, utilized casting beds along the building pad’s perimeter to allow panel forming, concrete placement and erection to occur simultaneously with the extensive under-slab plumbing, sloped floor slab work and freezer slab floor construction. Vice President, Dan Delforge of Cadence McShane commented, “The use of over 90,000 sq. ft. of casting beds on this project was critical in getting the building structure and walls up within three months. Ten weeks after the project began, the tilt wall panels were already being set in place even as the last of the floor slab placement was continuing.” The speed of tilt-up construction allowed the shell of the facility to be erected and enclosed on a very compressed timeline and permitted the subcontractors to begin interior construction of the insulated wall panels and installation of complex mechanical, electrical, plumbing and fire protection systems. When it was determined more cold storage was needed, the clear height of the freezer warehouse portion of the building was raised to allow taller racking and more capacity. Two interior tilt-up wall panels structurally isolate the freezer warehouse from the adjacent functions, essentially creating a box within a box. The interior concrete wall panels act as wind bracing for the production building, freeing up the floor plan from the usual steel X-bracing. Panels on the east elevation are reinforced to allow openings to be cut for future expansion. Screening of roof-mounted equipment was a major concern of the Missouri City Planning and Zoning reviewer. To alleviate this concern, tilt-up wall panels were extended vertically to create a parapet, hiding the vast refrigeration units and racks of refrigerant piping located throughout the roof area. With completion of the building construction approaching, the end product of our designed facility is anxiously awaited, much like the pastry chef peeking into the oven, to see if his dessert is progressing as envisioned.